Many people who come visiting Bangalore once a year or even once in six months claim they feel the city has again changed in that brief span of time. And they are right! The city continues to grow at a rapid pace with new buildings, offices and malls being set up every month. But certain areas retain the charm of the past, even as they continue moving with the time. We are referring to the shopping areas of Bangalore, this doesn't include the malls or localities that have become posh shopping destinations for branded products. The areas of Bangalore that can still set your heart thumping and your wallet opening of its own accord are the street shopping destinations that have been around for a long time. So if you are looking for the renewed zest in life that only shopping can bring, then head over to the following shopping destinations in Bangalore. Be warned though; you will need plenty of energy, some encouraging company, maybe an umbrella and of course a keen eye! Chickpete is a large area that sells both wholesale and retail products. Don't be fooled into thinking that Chickpete only is famous for sarees! In fact, the entire region sells various items ranging from plastic products and home decor items to puja products and clothing. The usually crowded market area is ideally visited during weekdays, if you wish to shop in peace without the crowds bothering you. You can shop for a variety of items including silk products, jewellery, cotton clothing, dress materials, etc. The vast variety might tempt you to shell out more than you originally planned to! A Saree Shop in Chickpete. 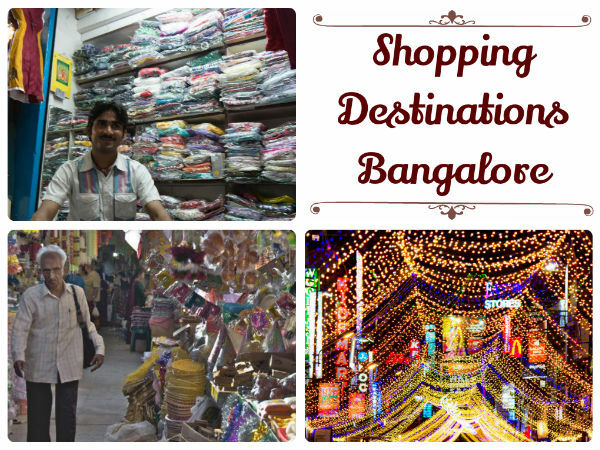 Among the most iconic destinations in Bangalore is Brigade Road, a shopaholic's paradise. Brigade roads with its branded stores used to be one of the most stylish and glamorous areas in the city. However, don't worry about shopping at the brand stores, the many smaller shops located alongside the brand outlets will provide great bargains on some rather unique products. The Tibetan Plaza is a favourite among bargain hunters in the city, products ranging from bags to clothes and fashion accessories can be bought at a good bargain. With its sheer variety of shops and food stores, Brigade Road is one place where you won't tire of shopping. This shopping area in Bangalore sees crowds from across the country, and many times even foreigners looking to buy artistic items. The many roads here are somewhat like a maze to a newcomer, but each of these roads leads to a shopper's paradise. Shops here sell everything from lace to wedding jewellery and clothing. Some of the antiques shops here are nearly as old as few of the vintage items they are selling. The destination is considered ideal for wedding shopping as you get the perfect balance of expensive products and cost-effective purchases. Footwear, bags, accessories, dresses, art items, home furnishing, the list is endless. And if you are swooning at the very thought of walking around this maze, fret not! The shops are complemented by a variety of food joints and street food options to energise you and your partner! The Festive Lights on Commercial Street. The entire region around Jayanagar 4th block's BDA complex has seen much change over the past decade. But the complex and its many shops look nearly the same. The large complex sells everything from home furnishing to clothing and even puja requirements. The shops nearby also sell a variety of products such as artificial gold jewellery that costs little and looks amazing. The clothing shops sell materials ranging from cottons to silks and other fancy materials such as georgettes and chiffons. The area also provides street food options and restaurants you can relax at while taking a bite. Inside the Complex at Jayanagar 4th Block. This region in Bangalore is famous for its brand factory outlets, ranging from jeans to shoes, get your best bargain here. The many other shops in the vicinity today sell products such as home-furniture, lighting, soft furnishing and a lot more besides clothing. Marathahalii offers a vast expanse of lifestyle products to choose from at negotiable rates. The area also boasts of movie theaters and food complexes. Plan an entire day in the area, start with a pampering beauty package, get some shopping done, catch a movie and dine out, all this and more at Marathahalli! The Evening Buzz at Marathahalli.